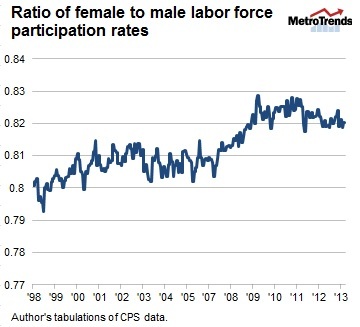 Overall labor force participation is falling, but women’s participation is rising relative to men. Back in 1998, only about 80 women for every 100 men were engaged in the labor force. That ratio peaked near 83 in 2009 just after the recession. In the prolonged jobless recovery, the ratio has remained steady around 82, well above historical averages. Women have done even better on employment relative to men. The increase appears to be here to stay, and is not affected by changes in the composition of the population. The ratio of female-to-male labor force participation holding the population’s composition (age, race, and gender) constant at 2006 levels is nearly identical. As women are taking on a growing share of the work burden, the gender wage gap has closed modestly. The next chart shows the percentage difference between women’s and men’s hourly earnings (for full-time workers). It adjusts for education, industry, and occupation, so that, for example, female accountants are compared with male accountants, and female high school graduates are compared with male high school graduates. Some argue that women face a wage deficit because of career choices they make, but those choices are not made in a vacuum. Often, occupations with increasing proportions of women become less well paid over time, becoming “velvet ghettos.” And opportunities for advancement are more limited so that differences in wages become more pronounced over the span of a career. That women are less likely to stay in the labor force continuously is both a cause and an effect of the wage gap, since a couple considering a year off to care for children will prefer on purely economic grounds that the lower-paid worker take a year off. The bottom line is, back in 1998 women earned only about 79 cents for every dollar comparable employed men earned, and today it’s about 83 cents. A few cents on the dollar may not sound like the best Valentine’s Day present ever, but it does represent many thousands of dollars a year more for the average woman. Follow Austin Nichols (@AustnNchols) on Twitter.